Did you miss out on the Freo Ball or are you still reminiscing about what a great night it was and looking for the next big event to attend?! Makenzie Hewitt started raising money for the Cancer Council when she was just 9 years old. Now at 16 she has become the youngest Named Fund Holder at The Fremantle Foundation. Makenzie made news in 2016 for being the Sunrise Suburban Superstar after being nominated by her neighbours for her fundraising efforts via her event “See the Sunrise for Sick One’s”, an annual sausage sizzle held at the North Fremantle Bowling Club. Since it’s inception in 2011 Mackenzie has raised over $15,000 for cancer research. 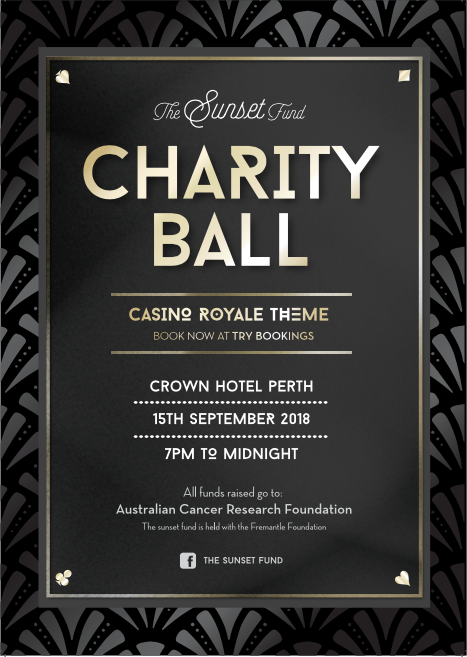 The Sunset Fund are hosting a ‘Casino Royale’ themed Charity Ball with all funds raised supporting the Australian Cancer Research Foundation.